All that glitters is not gold ... especially when it comes to modern money. A close look at many banknotes issued throughout the world today will show that quite a few of them possess features that glitter. As the search for inimitable features are undertaken by security printers, devices that shine, sparkle and iridesce are becoming more common on banknotes. The first modern device incorporated into a banknote to have reflective properties was the ‘Stardust’ security thread, which is also known as the ‘segmented thread’ or the ‘windowed thread’. From one side of the banknote this security thread appears to be a simple, wide security thread imbedded in the paper. From the other side of the note, the thread appears to have been woven into the paper, with part of the thread imbedded in the note, while sections of the thread appear on the surface. Usually coated in aluminium, the surface of the thread has a dull shine. The Stardust thread is common on many of today’s banknotes, but at the time it was introduced, it was a challenging innovation. Examples of the Stardust thread can be seen on the 1000-new-zaires note of Zaire issued in 1995, where two threads are used—a wide and a narrow stardust thread. While Stardust threads have a shiny surface, this quality was not the driving force behind their introduction. The shine or ‘glitter’ was largely a by-product of the innovation. However, the latest security threads have specifically increased their ‘glitter’ qualities by being coated with an iridescent surface. The exposed surface of these security threads reflect the colours of the spectrum when ordinary light hits the surface. While these types of security thread are not common, they will undoubtedly become more so in the coming years. The 100- and 500-taka notes of Bangladesh issued in 2000 and 2001are two notes that carry such a security thread. One feature to have increased the ‘glitter’ content of many banknotes over the past few years is the foil strip, which is affixed to the surface of the notes. The most common of the strips has the strip broken into alternate sections of silver foil and transparent tape, with the silver sections being cut at an angle. 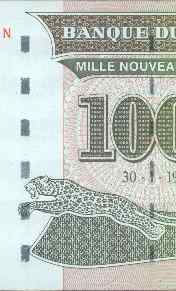 Examples of this type of foil strip are found on 5,000- and 10,000-franc notes issued by the Central Bank of the West African States. A variation of this strip appears on the 10,000-franc note issued by the Central Bank of the Comores, where the foil strip is wider and the reflective sections are gold, not silver. These adhesive strips, with metallic and clear sections, are one security printer’s contribution to the world of glitter. Most notes with this feature are issued by countries with close ties to France, and it is apparent that this type of foil strip is the French printer’s initiative. Other security printers have moved in different directions, in order to add glitter to their notes, with one innovation being the use of simple silver foil stamps. These foil stamps are cut into specific shapes and affixed to the banknote. An example of this can be seen on a 500-dirham note issued by the United Arab Emirates. Initially issued in 1993 without the foil stamp, the new security feature was added to the issue dated 1996. The foil stamp on this issue is the silhouette of a fortified tower. Simple silver foil stamps had a surprising short period of use. The scarce use of this type of foil stamp is due to quick advances in the development of similar security features, because foil stamps that contained images were being developed and superseded the use of simple foil stamps. Foil stamps containing images that reflect light really increase the ‘glitter’ quality of the banknotes on which they are used. Generically known as Optically Variable Devices (OVDs), examples of foil stamps with reflected images are now found on many banknotes, although the style of these devices differ. One of the first OVDs was used by Note Printing Australia on the 10-dollar commemorative note issued in Australia in 1988. 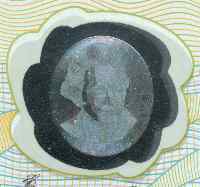 The iridescent foil stamp used on these notes is suspended in a clear window and has a portrait of Captain Cook that reflects the colours of the spectrum as the angle of light changes. This style of OVD has been used on a number of notes prepared by Note Printing Australia, including the 50,000-rupiah note issued by Indonesia in 1993 and the 50-dollar commemorative note issued in Singapore in 1990. A different style of foil stamp produced by Note Printing Australia can be found on the 100-yuan polymer note issued in China in 2000. In this case the foil stamp is not suspended in the clear window of the note, but is affixed to the polymer surface. The foil stamp has an image incised in the foil, causing light to be reflected in an iridescent pattern. The OVDs used by Note Printing Australia contain a single image that is always apparent, but which reflect the colours of the spectrum as the angle of the light changes. A different style of OVD sees the use of multiple images in the stamp, which appear and disappear as the angle of the light changes. Such devices are used on the higher denomination notes issued in Kuwait. Cut in the shape of an bird’s head, the foil stamp contains multiple images of a dhow and the note’s denomination in Arabic numerals, which appear and disappear as the foil stamp is tilted at different angles. Depending on the angle of light, the colours of these images also change. A similar device appears on the notes issued by the Chatham Islands to celebrate its status as the first place to see the sun in the new millennium. On these notes a foil circle contains repetitions of ‘2000’ that appear and disappear as the note is held at different angles. The various repetitions also change colour as light is reflected. A very clever use of an OVD with multiple images can be seen on the 20- and 200-riyal notes issued by the Kingdom of Saudi Arabia to celebrate its centenary. The OVD used on these notes is probably the largest OVD to be used on any banknote. The OVD is constructed in two parts, a central section and a border section. The border contains many small representations of the Saudi symbol of a palm tree surmounting two crossed swords. These iridescent images behave in the same manner as the images on the OVDs used on the notes of Kuwait and the Chatham Islands. 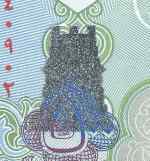 However, in the centre of the OVD on the Saudi Arabian notes are two discrete images. One image is a circular pattern containing Arabic text, while the other image is the symbol created to celebrate the centenary of the Kingdom of Saudi Arabia. As the OVD is moved, and the light reflected, one or the other of the iridescent images becomes apparent. Following the production of images on foil stamps, foil strips have been manufactured with the same properties and these strips have made an impact on the ‘glitter’ market. Combining reflective images with the benefits of affixing continuous foil strips to a sheet of banknotes, many issuing authorities are making increased use of the glitter properties provided by such devices. 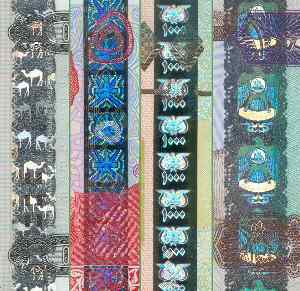 These types of foil strips can be seen on notes issued by Eritrea, Oman, Yemen and the United Arab Emirates. In each case an iridescent pattern is repeated on the strip and in some cases the denomination is etched into the strip by a separate process. It has become common to describe all reflective images incised into foil devices as ‘holograms’. This is not the case and caution should be used in describing them as such. A true hologram has an image with depth and none of the foil stamps described so far have images with this property. However, there are foil stamps that contain holograms. Examples can be found on a 500-riyal note issued in Qatar and in the higher denomination notes of Bahrain. The 500-riyal note issued by the Qatar Central Bank in 1996 contains a foil stamp with a hologram consisting of the state emblem surmounted by the denomination in Arabic numerals. 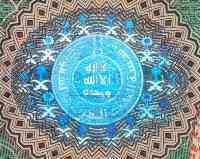 Surrounding this image is the denomination repeated many times in iridescent Arabic and western numerals. The denomination in Arabic numerals is apparent when the note is tilted at one angle, but they disappear and the denomination in western numerals appears when the angle of light changes. Most importantly, while most iterations of the denomination appear to be placed on the surface of the foil stamp, three rows of the denomination seem to be running beneath the state emblem at a level below the surface of the hologram. This appearance of depth occurs only on a hologram. 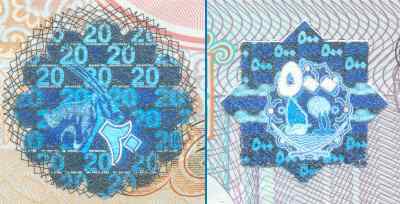 Similar characteristics are apparent in the holograms used on the high denomination notes issued by Bahrain in 1998. In this case the principal images are the head of an oryx and the denomination in Arabic numerals. Once again, iterations of the denomination, in iridescent Arabic and western numerals, appear to be displayed at different depths within the hologram. The manufacture of reflective foil devices is relatively expensive and for this reason many of these devices are only used on high denomination notes. However, as with all technology, costs reduce as the device is more commonly used and as competition between security printers increase. In addition, as counterfeiters become more adept at reproducing banknotes, the incentive to use more sophisticated devices also increases. Despite being attractive to many issuing authorities, not everyone wants to adopt ‘glitter’ technology. Shortly after Australia introduced the OVD in the bicentennial 10-dollar note, the United States of America’s Bureau of Printing and Engraving tested the OVD with adverse results. In testing the ability of banknotes to wear, the Bureau of Printing and Engraving put banknotes through many tests. One of these tests is a crush test, where a banknote is rolled tightly to the size of a cigarette, then placed into a cylinder and crushed. When subjected to this test the OVD shattered and it was therefore deemed an unacceptable technology to adopt. Technology has moved in many directions since 1988 when the OVD was first introduced, but there are still many authorities who have not adopted this technology. Some may not do so in the belief that the devices will fail to sustain the wear that circulation demands and some may not use the technology because of the cost. What is certain, is that it is only a matter of time before all banknotes contain a little glitter.